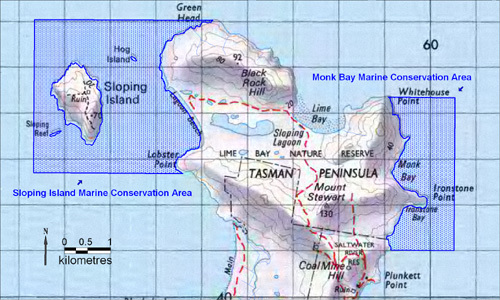 The Sloping Island Marine Conservation Area encompasses 940.3 hectares surrounding Sloping Island off the northwest of the Tasman Peninsula. The reserve contains important habitat for threatened species including the spotted handfish (Brachionichthys hirsutus) and the red handfish (Brachionichthys polities). The area also contains a high diversity of invertebrate life, a small bed of giant string kelp (Macrocystis pyrifera) and a shark refuge area. Sloping Island supports large breeding populations of little penguins (Eudyptula minor) and short-tailed shearwaters (Puffinus tenuirostris). The reserve also contains part of the 'Frederick Henry Bay Beach Alignment' Tasmanian geoconservation site; which provides a textbook example of beach alignment concordant with wave refraction patterns, and occurs on beaches throughout Frederick Henry Bay. The area was proclaimed a conservation area under the Nature Conservation Act 2002 on 9 December 2009. This reserve class provides for the protection and maintenance of the natural and cultural values of the area and the sustainable use of natural resources. Fishing is permitted in the reserve. Rules and regulations relating to recreational fishing in Tasmania can be found in the Recreational Sea Fishing Guide.